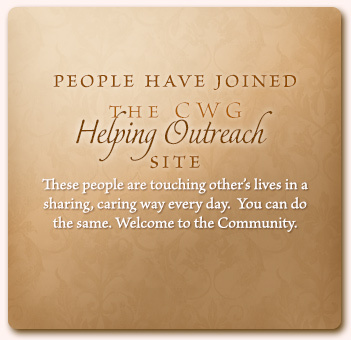 …to create a global CWG Helping Outreach that you may join right now so that, if you do not want to do so, you do not have to ever again go through sudden change in your life all alone, without other human resources or emotional support. There is a volunteer Spiritual Helper scheduled every day, committed to answering requests for practical spiritual guidance through dramatic change, within 24 hours of being posted. This website was created as a companion to the book When Everything Changes, Change Everything, in order to provide a global community for help and change. To find out more, please click below! Do you feel called to help others, but just don’t know how? Do you know the Conversations with God material, realize its power, and wish to share it? Do you have a little extra time? Consider becoming a Spiritual Helper. The Helping Outreach offers many levels of interaction with people who are familiar with the material in When Everything Changes, Change Everything and the Conversations with God books. Personal Spiritual Coaching is available. Please consider supporting the site with a tax-deductible contribution. As a thank-you gift, you’ll receive a downloadable Study Guide.